CIGNAL ruled the Spikers’ Turf Season 1 Reinforced Conference after beating Philippine Air Force, 25-17, 32-30, 25-23, in the deciding Game Three on Sunday at The Arena in San Juan. Cebu native Edward Ybanez topscored with 13 points while Lorenzo Capate Jr. and Edmar Bonono added 10 markers apiece as the HD Spikers took the final two games of the best-of-three series. "Masaya ako kasi first time ko maglaro sa Manila tapos champion pa," said Ybanez, an Electronics and Communication Engineering graduate from University of Southern Philippines Foundation. 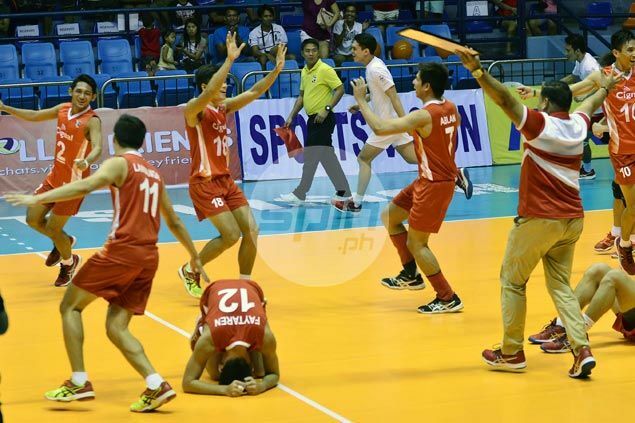 Cignal coach Michael Carino was proud to see his players bounce back from the Game One loss. The HD Spikers lost Game One, 15-25, 25-19, 19-25, 19-25, before they regrouped in Game Two, 25-16, 25-17, 25-18. “Sa Game One we were lousy then sa Game Two naayos namin, sabi ko sa kanila may purpose kung bakit tayo nanalo sa Game Two, kaya atin na ang championship sa araw na ‘to,” said Carino. Carino also added that they capitalized on the absence of Air Force top hitter Ranran Abdilla, who was nursing a sprain. “Imagine, isa sa pinakamalakas na outside spiker ng Pilipinas ‘yun, isa rin sa factor na pinag-igihan namin kasi may kulang sila,” he said. Rodolfo Labrador finished with 12 points for Air Force while Jeffrey Malabanan added 11.